NEBNext Ultra II Q5® Master Mix is the most recent NEBNext formulation of Q5 High Fidelity DNA Polymerase, optimized for amplification of NGS libraries. This hot start formulation is designed for robust, high-fidelity amplification of next-generation sequencing (NGS) libraries, and further improves the uniformity of amplification of libraries, including superior performance with GC-rich regions. NEBNext Ultra II Q5 Master Mix is also included as a component in all NEBNext Ultra II kits, for DNA and RNA library preparation. The NEBNext Ultra II Q5® Master Mix is the most recent formulation of Q5 DNA polymerase that has been optimized for robust, high-fidelity amplification of next-generation sequencing (NGS) libraries. This new formulation further improves the uniformity of amplification of libraries, including superior performance with GC-rich regions. The polymerase component of the master mix, Q5 High-Fidelity DNA Polymerase, is a novel thermostable DNA polymerase that possesses 3´→5´ exonuclease activity, and is fused to a processivity-enhancing Sso7d domain. Q5 also has the highest fidelity available (> 280-fold higher than that of Taq DNA Polymerase), resulting in ultra-low error rates. The NEBNext Ultra II Q5 Master Mix is an aptamer-based hot start formulation that allows simple room temperature reaction set up. The convenient 2X master mix format contains dNTPs, Mg++ and a proprietary buffer, and requires only the addition of primers and DNA template for robust amplification. NEBNext Ultra II Q5 Master Mix is also included in all of the NEBNext Ultra II library prep kits, for DNA and RNA. 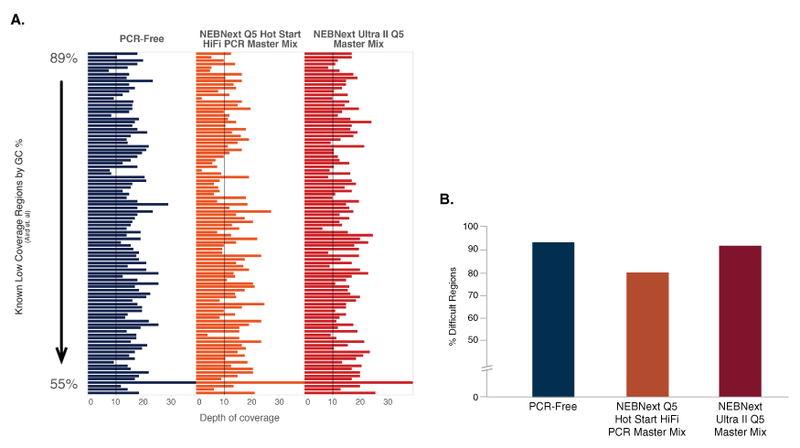 NEBNext Ultra II Q5 Master Mix provides improved coverage of known low coverage regions of the human genome. Libraries were prepared from Human NA19240 genomic DNA. One library was not amplified. The other two libraries were amplified using 5 cycles of PCR with NEBNext Q5 Hot Start HiFi PCR Master Mix (NEB #M0543) or with NEBNext Ultra II Q5 Master Mix (NEB #M0544). Libraries were sequenced on an Illumina® NextSeq® 500. 420 million 75 bp reads were randomly extracted from each dataset, representing an average coverage of 10X. Reads were mapped to the GRCh37 reference genome using Bowtie 2.2.4. Reads on each region were counted using bedtools v2.19.1. A: The number of reads overlapping distinct low coverage regions of the human genome (1) are shown for each library. B: From the 420 million 75 bp reads randomly extracted from each dataset, 10X coverage was expected. The % of difficult regions covered at > 10X are shown for each library. The NEBNext Ultra II Q5 Master Mix provides improved coverage of these known low coverage regions, without drop-outs, and shows similar coverage to the unamplified sample. Ultra II provides the highest and most uniform coverage of difficult sequence regions. 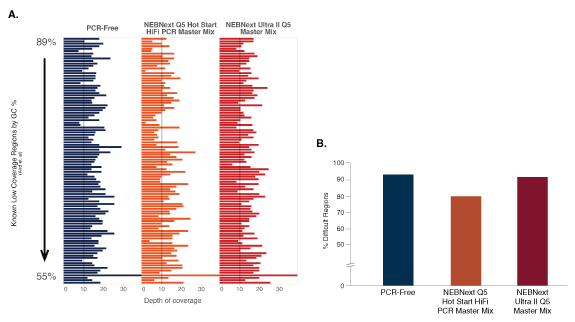 Indexed libraries were prepared from 100 ng of Human NA19240 genomic DNA using a PCR-free workflow or the library prep kits shown, following manufacturers’ recommendations. The PCR-free library was prepared using NEBNext Ultra II. Libraries were sequenced on the Illumina NextSeq® 500. 420 million reads were randomly extracted from each dataset, to produce an average coverage of 10X. Reads were mapped to the GRCh37 reference genome using Bowtie 2.2.4. Reads on each region were counted using bedtools v2.19.1. The number of reads overlapping distinct difficult, low-coverage regions of the human genome (1) are shown for each library. Ultra II provides the highest and most uniform coverage of these difficult regions, and provides the coverage closest to that obtained with a PCR-free protocol. NEBNext Ultra II Q5 Master Mix provides uniform GC coverage for microbial genomic DNA with a broad range of GC composition. Libraries were made using 100 ng of the genomic DNAs shown and the NEBNext Ultra II DNA Library Prep Kit. Libraries were amplified using the NEBNext Ultra II Q5 Master Mix, and sequenced on an Illumina MiSeq. GC coverage information was calculated using Picard’s CollectGCBiasMetrics (v1.117). Expected normalized coverage of 1.0 is indicated by the horizontal grey line, the number of 100 bp regions at each GC% is indicated by the vertical grey bars, and the colored lines represent the normalized coverage for each library. NEBNext Ultra II Q5 Master Mix provides uniform GC coverage regardless of the GC content of the DNA. An E. coli strain that carries the Q5 High-Fidelity DNA Polymerase gene. NEBNext Ultra II Q5 Master Mix, DNA template and 1 μM primers in a total reaction volume of 50 μl. Popatov, V. and Ong, J.L. (2017). 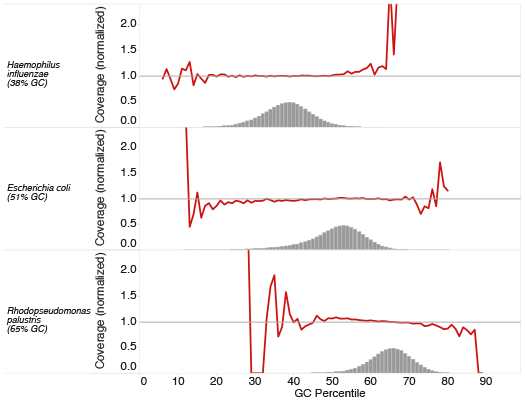 Examining sources of error in PCR by single-molecule sequencing. PLoS ONE. 12(1), e0169774. Aird, D. et al. (2011). 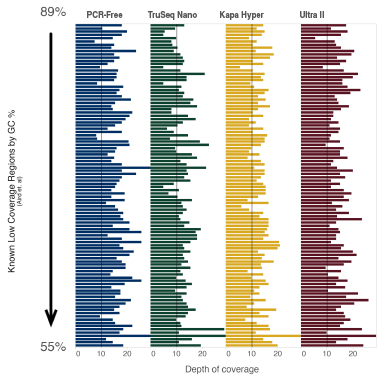 Analyzing and minimizing PCR amplification bias in Illumina sequencing libraries. Genome Biology. 12(2), R18. What’s New About NEBNext Ultra II Q5 Master Mix? Is NEBNext Ultra II Q5 Master Mix a hotstart? Is NEBNext Ultra II Q5 Master Mix the same as the Q5 Hot Start High-Fidelity 2X Master Mix (M0494)? What is the difference between NEBNext Ultra II Q5 Master Mix and NEBNext Q5 Hot Start HiFi PCR Master Mix (M0543)? What is the difference between NEBNext Ultra II Q5 Master Mix and NEBNext High-Fidelity 2X PCR Master Mix (M0541)? What cycling conditions should I use for NEBNext Ultra II Q5 Master Mix? Can I scale up the PCR reaction volume in order to increase library yields? How many cycles of PCR should I perform with NEBNext Ultra II Q5 Master Mix? Can I use NEBNext Ultra II Q5 Master Mix to amplify low quality DNA, such as FFPE DNA? Will NEBNext Ultra II Q5 Master Mix incorporate dUTPs? Can I use NEBNext Ultra II Q5 Master Mix to amplify bisulfite-converted libraries? Are the DNA products produced by NEBNext Q5 Hot Start HiFi PCR Master Mix blunt-ended or do they have a single base 3’ overhang? Is NEBNext Ultra II Q5 Master Mix compatible with beads typically used in NGS workflows? Can I use NEBNext Ultra II Q5 Master Mix to do simple end-point PCR experiments?